As a school superintendent, Brian Keim expected to deal with standardized tests and union contracts. He didn’t count on insulin shots and untended broken bones. For years, Laker Schools, a small, rural district in Huron County at the tip of Michigan’s thumb, didn’t have a school nurse, leaving untrained school secretaries to parcel out medication and give insulin shots between other tasks. Too many kids, Keim recalled, didn’t get medical care at all. That changed in 2012 when the district formed a partnership with Scheurer Hospital in Pigeon to place one of the hospital’s nurses in the 500-student combined middle and high school during morning hours. Other Michigan students aren’t as lucky. About 800,000 kids across the state ‒ slightly more than half of all public school students - attend classes in buildings without a school nurse. Michigan has the third highest ratio of students to school nurses in the nation, according to a survey by the National Association of School Nurses. No one knows the exact figures because Michigan doesn’t track school nurses. Michigan would need 1,757 more school nurses just to meet the federal recommended staffing level, according to a 2014 Michigan-based survey. That would take $88 million a year, at a conservative estimate of $50,000 per nurse. Believing that funding help from Lansing is unlikely, some districts are holding out their hats to their communities, looking for support from hospitals, county health departments and foundations to get nurses back into school buildings. A 2008 survey found Michigan ranked 48th among the states in the ratio of students to school nurses, with 4,204 students per school nurse. Vermont had the lowest ratio, at 275 students per nurse. Closer to home, the ratio in Indiana was 1,022 students per nurse; Ohio, 2,377. The only states that had higher ratios were Utah, at 4,893 students per nurse, and Hawaii, which doesn’t have any school nurses. The shortage appears to be even more dire today, according to a report by the Michigan School Nurse Task Force, a committee formed by the Michigan Department of Education and Department of Health and Human Services to assess the issue. Only 28 percent of school districts had access to any type of school nursing services. Only 23 percent provided direct access a school nurse or other clinical service. About 46 percent of public school students (which include traditional public schools and charter schools) attended a district with nursing services, leaving 801,000 students without services. Overall, there was one full-time-equivalent nurse for every 6,570 students in the state. That’s eight times the ratio of one nurse per 750 students recommended by the U.S. Department of Health and Human Services. School nurses do more than provide bandages for playground scrapes. Studies show that schools with nurses have lower absenteeism. School nurses help identify children with mental health issues and help manage chronic health issues. Kids with asthma missed fewer days of school and were hospitalized less when they attended schools with school nurses, according to one study. “I can’t emphasize enough, a healthy learner is a better learner,” Laker Superintendent Keim said. Like most states, Michigan has no statewide policy on school nurse staffing levels, said Linda Meeder, school nurse consultant for the Michigan Department of Health and Human Services. School districts and charter schools get per-pupil funding from the state, and individual districts make decisions on how to spend those funds. Some set aside money for nurses, others put every possible dollar into the classroom. There were no school nurses in 31 Michigan counties in 2014, according to the survey by the Michigan School Nurse Task Force. One of those counties was Barry County, south of Grand Rapids. Cash-strapped districts, forced to make choices between classroom teachers and ancillary services like school nurses, always pick teachers, said Rich Franklin, superintendent of Barry Intermediate School District. Without school nurses, “school secretaries are on the front lines of these things,” Franklin said, handing out prescription medication, measuring carbohydrates for diabetic children and giving insulin shots. Franklin and Laker Superintendent Keim said they also worry about liability if a school employee not medically trained accidentally harms a student. The Barry ISD recently hired a nurse who works primarily with students with special needs, Franklin said. That nurse has been able to help train staff at county schools who have students with unusual health issues, such as a feeding tube or frequent seizures. “Admittedly, it would be nice to have a school nurse” at individual schools, Franklin said, but the training now available for non-medical staff is better than the situation was in the Barry schools as recently as 2014. Laker Schools solved its nursing shortage by asking for help from neighboring Scheurer Hospital. The district was able to provide an office for a nursing clinic after consolidating administrative staffs at the middle and high school. 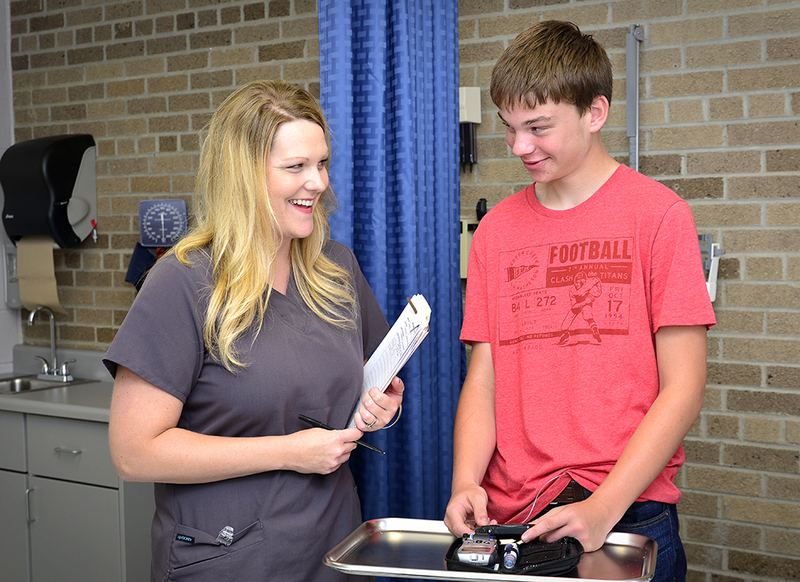 In 2014, the hospital expanded its school nurse program to Caseville Public Schools. The service is free to the schools, but costs the hospital about $50,000 per school year per school district. That money is part of the hospital’s budget set aside for community service. “It seems a little hokey, but it’s not just about taking care of sick people, but figuring out how to keep people well,” Gascho said. Across the state, Munson Healthcare Charlevoix Hospital provides four nurses to nine school districts. In south central Michigan, Athens Area Schools partnered with the Calhoun County Health Department to provide a school nurse, supported through a grant from the W.K. Kellogg Foundation. The Athens nurse “has been a tremendous help educating families,” said Franklin, who previously was Athens superintendent. You should see the innovative solutions happening in Branch County Michigan- our hospital has teamed with 3 local districts to provide telehealth clinics to middle and high school students- it is amazing! Ancillary services like nursing in schools have disappeared from many schools due to budget cuts over the past decade. Liaison officers, counselors, school nurses, librarians, and many other support positions have been eliminated in public schools. These were important services, but a lack of adequate funding forced their elimination. Of course there were also deep cuts to instructional and administrative staffing. The State Commissioned a feasibility study which has for the most part been swept under the rug. The Bridge has covered it seriously, but there is no suggestion that our current legislature or the governor will actually move to implement any of the study's recommendations. We can't expect to have great schools with great programs and services unless we are willing to fund them. It is a pretty simple equation. This comment reflects the current knee jerk overthinking that we all are familiar with, that comes from Republicans, Libertarians and Conservatives, or the generalized government hater. You know, the point comes with a lot of things, child health care quite obviously is among them, when you have to let some reality based thinking take hold. Did you read this article at all? Michigan schools today are not dealing with the phalanxes of healthy baby boomer children who were matriculating 50 or 60 years ago. Their mother was usually at home, watching over their health like a hawk, making home made meals and getting them to a doctor when they were sick. But, they also had school nurses, in every school, and mandatory shots and teeth cleaning. Let me assure you, we stood dutifully in line regularly to get our shots or to get into the portable dentist chair to get fluoride paste smeared onto our teeth. That is not the case today. Many children get little to no nutritious food at home, and their mother got no good prenatal care. They are diabetic, they suffer from chronic respiratory and or ear infections, and they can fail to thrive. They may need glasses or a hearing aid, and nobody is paying attention. They need a school nurse intervening and getting them the health care they need. They need a visiting dentist or hygienist caring for their teeth. They need these things because nobody else is doing it, and you know what? Good dental care, good medical care and wellness education and screening is not optional--it's presence or absence leads directly to positive or negative adult outcomes. And sick adults, who bring far less than optimal health into adulthood, make the costs for all of us skyrocket. Lots of people want to pretend that healthcare and dental care are optional luxuries, like vacations and cell phones. That is simply foolish. We all pay when there is a huge baseline population of chronically sick people--we pay in healthcare cost, and we pay in increased infections for all of us. We're all right out here at ground zero of being around people who are sick all the time, and we can catch it from them, you know. To say you don't need medical care or dental care as a child is just some more of that "say anything you feel like saying--who care's if there is any data to back it up" that we get all the time whenever getting down in the hustings and solving problems in a failed economy where the manufacturing base is gone comes up. Lots of people don't want to solve problems, they want to go way out on limbs and make obtuse statements and arcane arguments so that time gets whiled away--while the problems grow worse and the people on the front lines trying to handle them--in this case school secretaries and teachers--get burn out. We don't need the first responders barreling up to the hospital in their ambulance, siren screaming, to take care of a child's diabetic shots. It is a far fetched idea to say that first responders could take the place of a school nurse. In fifth or sixth grade we were taken to the school library to find a play and read it for our assignment. I found a magazine with plays and located "Cat On A Hot Tin Roof". I was reading it when the librarian came over and told me that she had no problem with me reading the play, but perhaps I should select another one for our teacher's assignment. If she had not given my guidance I think I would have been in "hot water" with my very proper teacher! Later after college I went to graduate school and became a librarian myself. My wife was the school nurse for twenty six years and was the school nurse of the year for the state of Mi. She was asked to help write a grant to contract the service out. When it was approved she lost her job to an agency. She did it all for over 8000 students when she started and traveled the 600 square mile district and providing services to all 600 plus staff. You can bet these services in their entirety aren't all still being provided. What a loss to our and other communities in Mi. Thank you Gov. Snyder and others in Lansing. Reset some of your priorities . Love to hear some feedback.. R.L. What we asking of our School secretaries is a disgrace. They are expected to do it all. Some are not trained to do what is expected and they are already overburdened especially at the elementary level. When a principal is out of the building so much falls on them. You are really appreciated by me. R.L. The lack of funding is also why we have reduced voc ed operations. They cost far more to staff and have far higher capital costs than, say, an English class. Because they are running schools like a business, districts cut the high cost operations first. Can't blame them. And let's note...very few charter operations, if any, are providing either school nurses or voc ed. We are dismantling our public school system because of policies driven by right wingers in the Michigan House of Representatives. Time for a change. It seems corporate welfare is more important. I am wondering how my generation made it. No school nurses, no hot lunches, no hot breakfasts, no after school day care, no before school day care. Hell, we didn't even have buses. We walked! Is there any end to this? Is there no expectation of parental responsibility anymore? I hate to ask how old you are, I am sixty and when I was in elementary school fifty-five years ago we had hot lunch, a school nurse, buses and I walked only because I was close to my elementary school and junior high school. Parents were more responsible for their children's health and actions then, but as you are well aware that things have changed parents are working, split families, they are not there when their children get home from schools, the majority still care but are divided between family, work and outside involvement of their children's activities. There are so many more students who have rising health care needs as well as the school staff to have a school nurse is a godsend to many students that do not have parents who can seek regular doctors care. To outsource the job to a community agency is better than nothing but they do not know the families , their background or their siblings. It all boils down to who can secure the grant and for how long they can get it, nothing is like it use to be, sir. Dear Jim - those were different times and can't compare as much as you want. Behind 99% of these comment and the real reason our schools are in trouble far trailing most every other state for no good reason but Snyder' and his minions. Debate all the offsetting tentacles but at the core it is Snyder and his minions denial of knowing but not doing the right things for the citizens of Michigan but taking real good care of big business who in turn take care of the Republicans whose re-elections they finance. What a circle of ongoing deceit. It will continue unless the wronged citizens get out and vote for change. I don't know what school nurse do today, it has been a long time since we had kids in school. I wonder if the current approach to school nurses is creating a barrier to the appreciation of the value of school nurses. This article is focused on spending more of other people's money with little mention of the value the role provides. In fact that seems to be the sole [for for generations] approach to Michigan's education system, spend more and more of other people's money. Maybe it is time to start promoting the value the role of school nurse provides, describe how the school nurse is integral to a students learning success, to the schools success, to the communities success. The article link to a report that alluded how having a school nurse improved attendance, but it failed to mention any about how that link worked and why it worked. I would encourage a small team of school nurses in collaboration with a few parents and a few non-parents [ones that have commercial experience at selling services] to develop an inventory of current activities that nurses provide and the impact that has, develop a description of the value provided with a description of the economic value delivered. I would also encourage them to identify new or modified services that the school nurses could provide to grow the value they deliver. If you are proud of your knowledge and skills and how they provide value then promote it. Our economic world has changed and people no longer trust to rhetoric, they have to demonstrate through numbers at work to earn their money, they now want numbers to justify how their money is spent. I appreciate at least some of the value a school nurse can provide, my grand daughter has had to carry an 'epipen' since she first went to school. My daughter had to go school to school until she found a nurse [at a public charter school] that would work with her to establish a protocol for managing her daughter's risk at school due to her food allergies. They have moved and used what she developed with that nurse at other schools her daughter has attended. My point is that she had to seek out and interview school nurses rather then have the nurses and school putting that online promoting the importance and value that was available at their schools. People expect those who want their money to describe/promote the value they will receive for their money. I'm curious...if medical services are being provided, why doesn't medical insurance pay for nursing services? In my days, if you got hurt at school and/or needed medical care, your parents took you to the physician! Perhaps, we really need parent neglect laws to be enforced rather than burden schools with medical expenses that should be born by the parents. This could benefit society in several ways. First, it would reduce the number of people running around with tattoos as they now would be forced to care for their children at their own expense and provide them with the opportunity to open a medical saving account which would reduce the cost of medical care for that particular family and provide a sense of pride for caring for their children. I wondered how people could conclude that school nurses were not needed and that all we needed was to return to the 'good old days'... Thanks James for answering my question. Of course, the fact that both parents are working all day is apparently unknown to you. I went thru a complete K-12 education without a nurse, never saw or heard of one. However, I did have parents and the phones worked if there was a health need. I guess I was a victim! What's next, a dental hygienist? A wholistic medicine practicioner? A Chiropractor? A chaumine/medicine man? Last I knew there was an EMS service in every community for anything serious. Like at sports events. Mom and Dad for anything else. Schools are to educate not nurse. Today for liability a child shouldn't be touched except by a properly trained professional with permission and insurance provided like for everyone else. Perhaps schools struggle to educate as they are distracted performing any number of other services with the related costs. I'm still waiting for someone to explain why medical insurance doesn't pay for school nursing services. It's interesting we already pay at least twice for medical coverage (1. Medical insurance and 2. Medical coverage through car insurance). Paying for a school nurse would be a third premium payment. Barry, you know the definition of the liberal tax form - line 1: enter all you earned. Line 2: multiply line 1 by 110%. Line 3: this is your tax, turn it all in. Thus my previous response that the child would be turned over to the government upon birth and they would take care of everything. Barry, the insurance companies do not necessarily consider health related services delivered in a school setting to be "medical" and there are standards governing how this is defined. For example, if a parent can be trained to administer insulin and do blood glucose testing, the insurance companies will generally not pay for it. It has been my experience that most of the health care delivered in the school setting is not covered. Not only that, but note also that paying a health professional to deliver the care is extremely expensive. I was a school nurse for 21 years, and even after having been a critical care nurse in the hospital for 15 years beforehand, I found it to be the most challenging job I ever had. Jill, What was the nature of the challenges? What services do you feel the school nurses could be providing today that they aren't and how do you feel they would impact the classroom/learning? I wonder if they aren't an untapped resource already in the system. I'm the Regional Manager for School Health Programs with Spectrum Health in the Greater Grand Rapids Area. We've been extremely successful in delivering models of care to meet the needs of our school districts. The newest model being virtual health services and professional consultation with an experienced school nurse. Without an education, poverty is a near certainty. With poverty comes chronic disease and shortened life expectancy. By keeping kids in school and getting them right place care, we are improving our communities in the long run. Every child deserves an equal education and access to care.